Plaster mother mold with inner rubber mold and plaster core of head and shoulders of a child. 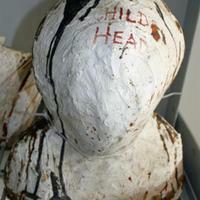 Written on mold is "Childs Head". There is a plastic zip tie holding the mold together.